Everyone loves trying something new, which is, in part, what makes sampling programs so effective. The opportunity to “try before you buy” is often irresistible, and when the product delivers, sales increase. Elevate recently partnered with Allionce agency in executing a fun, family-friendly sampling promotion taking place at 5 zoo locations across the U.S. Elevate’s brand ambassador teams did a great job bringing the Tree Top brand to life! The “Squeeze the Day” campaign had three primary goals: to provide samples of Tree Top’s newest see-through packaging, educate consumers about the Tree Top brand and products, and enhance the zoo experience. The event included cool giveaway premiums and fun photo opportunities with the Tree Top mascot. Elevate delivered a dependable team of brand ambassadors and costume characters for the program. 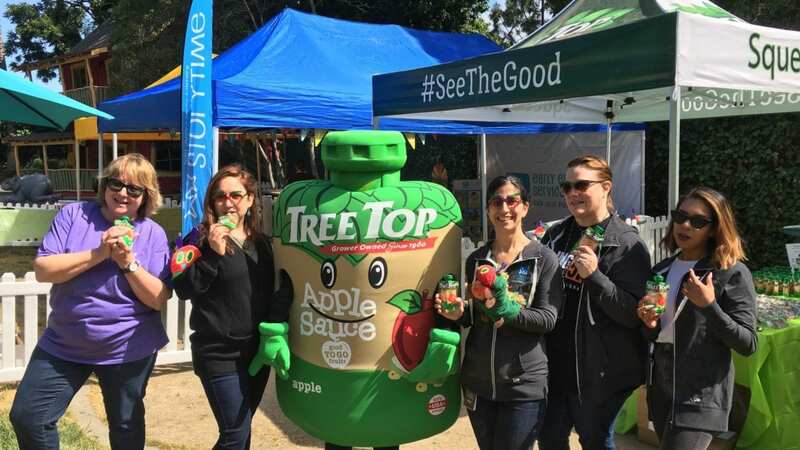 The team worked together to distribute samples, introduce Seymore Good (the Tree Top mascot), and encourage attendees to post to social media using the hashtag #seethegood. Brand Ambassadors were also trained on the surrounding areas of the zoo so they could answer questions and contribute positively to attendees’ zoo experience.